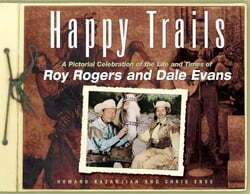 Roy Rogers and Dale Evans ruled the West from the silver screen as the King of Cowboys and and Queen of the West. Off screen, this husband and wife duo raised a family and lived the "Code of the West." Now, in this new book, the Rogers family shares their memories of Roy, Dale, and Trigger, along... read more with their other sidekicks and more than a hundred never before seen, behind the scenes photographs.